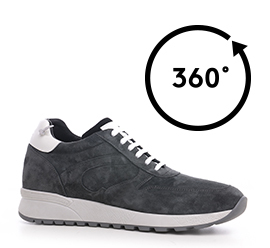 Sneakers with inner elevator system able to increase height up to 3.1 inches. Upper in brushed gray calfskin embellished with details in white full grain leather and sole in light grey rubber. Trendy and stylish the leather knots coming out from the heel tab. Inspired by the street style these sneakers are ideal to match with any casual outfit.